Photo View Advertising Postcard. Multi. Cardstock. 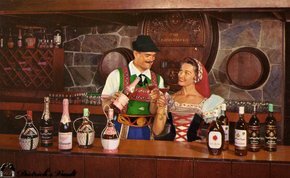 This glossy, full-color, card is titled, "Tasting Room of The Italian Swiss Colony Winery, Asti, California." It shows a costumed man and woman. Unused.